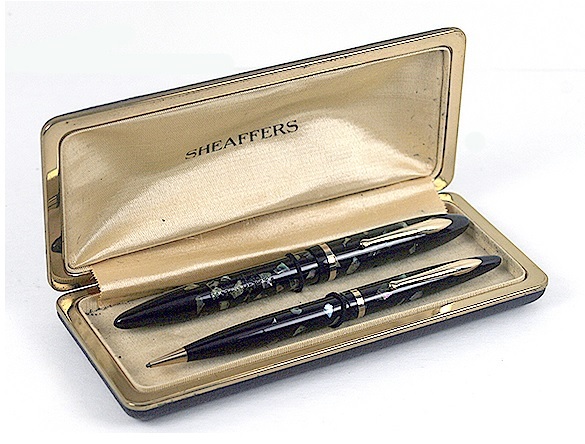 This 1936 #5 Feather-Touch lever-filler Balance set is the beautiful ebonized pearl. The trim is gold-filled, which warmly complements the material of the cap and barrel. The nib is a two-toned, fine. This set is new-old-stock, mint in the original box. This set is sold, but keep an eye on new catalogs for more Sheaffers! 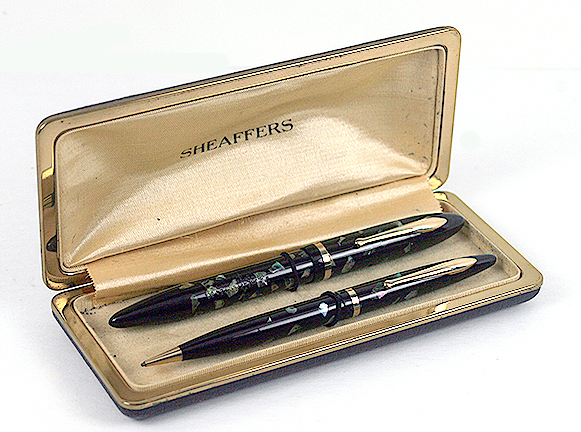 1936 #5 Feather-Touch LF Balance Set in Ebonized Pearl. GFT. Two-toned, fine nib. New-old-stock. Mint in original box. Close-up of set in box. This entry was posted in Vintage Pens and tagged Sheaffer. Bookmark the permalink. Follow any comments here with the RSS feed for this post. Post a comment or leave a trackback: Trackback URL.